I am selling 100g skeins from our flock of Llanwenogs, a beautiful medium size sheep, with black faces and black feet. It is a native breed, originating in West Wales, about 20 years ago they were declared at risk by the Rare Breeds Survival Trust, the resulting support and interest has enabled numbers to rise. This flock was born, raised and shorn in West Wales and the wool has been spun by a Welsh Woollen Mill near Newcastle Emlyn. It is truly a pure Welsh product. I am selling uncoloured skeins, so you can enjoy the natural creamy, off-white colour or dye your own batch. The wool is smooth and firm, and it knits particularly well as a cable pattern, as it has a good stitch definition. 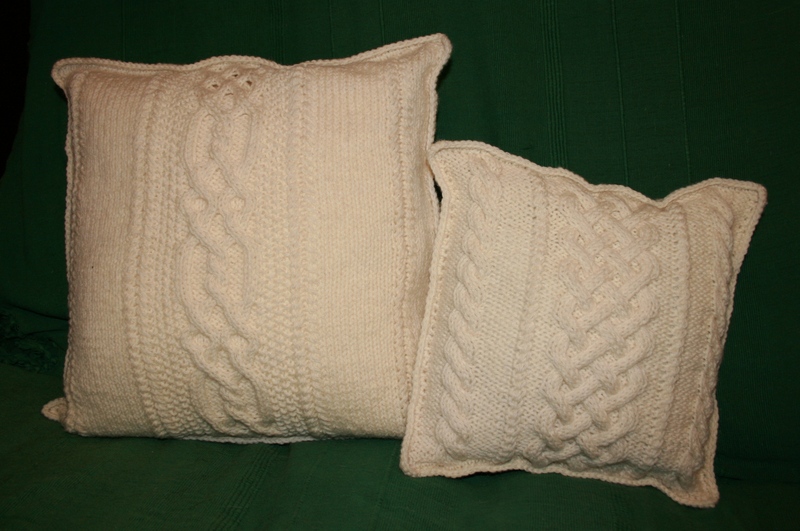 It is great for knitting jumpers and cardigans but also cushion covers or rugs. The photo of a cushion cover using cables is an example. 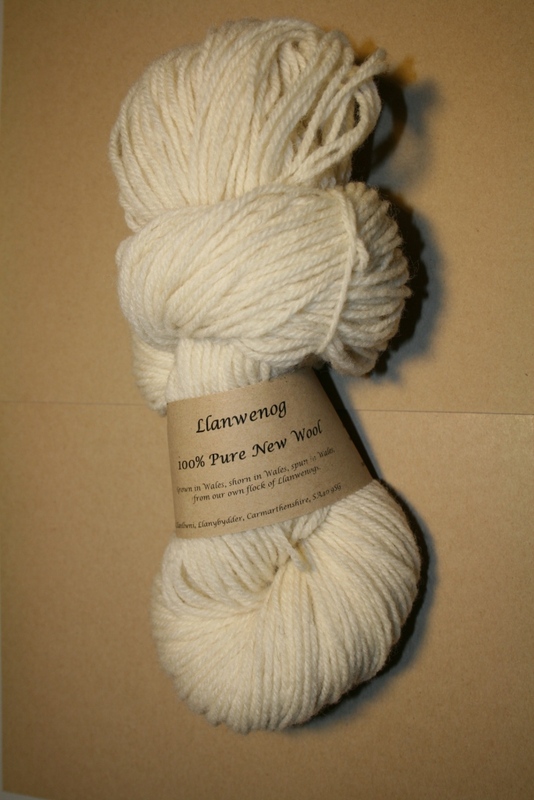 This entry was posted in Wool for sale and tagged cables, double knit, lamb wool, llanwenog, natural, pure wool, undyed. Bookmark the permalink. I have been using this wool for crochet and it has the best feel of any wool I have used before, it holds it’s shape beautifully. I love the feel of it in my hands. Delivery from Wales was speedy and affordable and it has been a great pleasure every time. Thanks so much! Sue delivers promptly,and the wool is a dream,a cream coloured fluffy dream at that. I thought I made pillow cases,two toned,with the black mountain sheep mix…but it is flying off my hook(yes the 2 skeins are gone) and I decided to scrap the pillow cases and make much much more out of this excellent wool!